These water parks have extensive stories about their background and how the water park came to be. The story for each water park is present in every aspect of the theming for the attractions, food stands and scenery. Blizzard Beach is a water park that was created from melting snow after a snowstorm hit Florida. Typhoon Lagoon is what is left after the typhoon came through and hit the park, causing things to be pretty tossed around. Both are equally as fun and done to the same level of perfection. The water parks offer the opportunity to rent cabanas for a bit of a private and more relaxed experience while you are there. You get a special seating area for your crew, plus shade covering, which is invaluable on hot summer days. You also receive an attendant, ice and bottles of water and towels for everyone in your party. You can also rent umbrella chairs for a lesser price, which only includes the umbrella chairs and towels. Either option can definitely aid in making your day at the water park more relaxed and comfortable. The water parks offer an unlimited refill mug option. You purchase the mug (which can be kept as a souvenir) and then you get unlimited beverages from the beverage station all day while you are there! This can be a huge savings during those hot days and help make sure that you stay hydrated and refreshed while you play. It is really nice to have so many lockers available for rent, for a reasonable price. You are able to leave dry clothes, snacks, your phone, etc. secure and dry so that you are free to move about the water park and not worry about keeping an eye on your belongings. I highly recommend that you put everything in the lockers since it will definitely make your day much less stressful and give you one less thing to worry about. Thanks to the beautiful Florida weather and the ability in the waterparks to temperature control many of the attractions, the water parks are open year round. It is nice to be able to visit in winter months and not be bundled up in sweaters and scarves. Only one water park may be open since the winter months are when they alternate taking the parks down for cleaning and refurbishments, but you will still always have an option! Disney water parks are unlike any other water park you could experience. 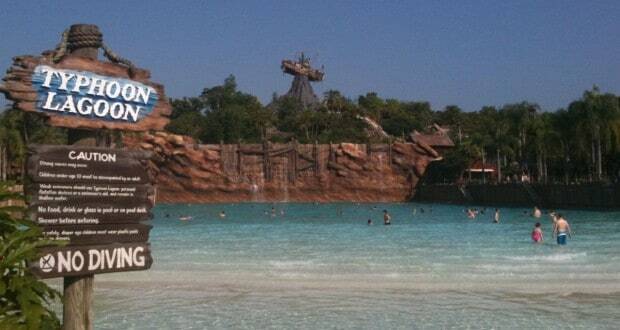 At Typhoon Lagoon you can snorkel around the man-made reef with stingrays and sharks! If surfing is your thing, you can also surf in the wave pool before park opening or even have a surfing party. At Blizzard Beach, you can experience one of the tallest, steepest free body slides in the nation. These water parks are extremely impressive and unique to Walt Disney World. Are you or a member of your group a thrill seeker? Well look no further. These slides and rides are definitely a rush. You have water coasters, family raft rides, extremely fast, steep and intense slides that leave you hoping that you made it to the bottom with all parts of your bathing suit. Many of the slides have height requirements so get prepared that smaller guests won’t be able to do most of these thrilling attractions.